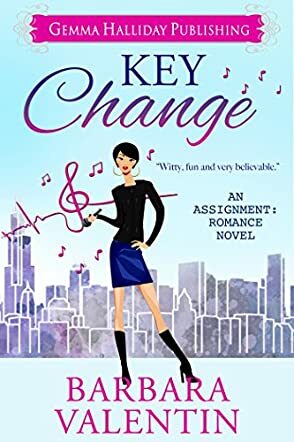 Key Change by Barbara Valentin is a wonderful romance that involves music, writing, newspapers, coming back from a horrible situation and not falling down the well but changing the situation into something good. Sara, the main character, is working for the Gazette as a music critic, and in her spare time she wins trophies at Karaoke contests between departments. Sara had had a bad experience with family life which led to her making decisions while desperately lonely, which obviously led to some big mistakes. At this point in the book, Ms. Valentin shows the reader what happens when one bad decision is followed up with another bad decision because of a bad self-image until life is a complicated mess. Enter Andrew, the hero of the story, a music director at St. Matthias Catholic Church. He is real and honest and so good looking. But he has had bad luck in the love department, so he is wary. The two of them get thrown together through crazy circumstances which I am not going to tell you; you must read the book. They find out that they are more compatible than either of them expected. And they start to grow close to each other and start to like each other ... and then the situation really gets crazy. Ms. Valentin took a chance making a hero an honest Catholic boy while the heroine is from a little rougher side of life. I was a bit nervous at first about how she was going to handle this. I didn’t want to read another good guy gone bad/rebel without a cause kind of story; been there, done that. But Ms. Valentin handled it very well. Yes, the girl is thinking about the things she would do to him, but she is always jolted back to reality, thank goodness. So, for those of you who want a nice romance, have no fear. Those of you who like a little steam, there is something for you too. Romance readers, chick lit readers, and those readers who just need a change of pace from more intense books, this is the book for you! A wonderful romantic story that has a happy ending! What more could you ask for?